A 3-RBI performance from left fielder Kai-ge Choe, who is tied for 4th in the 3L in total bases with 174, led the Houston 1837 BBC to a 9-5 win over the Echo Park Lakers. José Ledezma got credit for the save for Houston. It was his 2nd of the year. Echo Park has now lost 7 straight. One important at-bat came with the bases loaded in the top of the eighth inning. Facing Echo Park hurler Stef Dijkman, Mike Houston drew a walk, driving in 1 run. The 1837 BBC went on to win. "I don't feel you win baseball games by working harder than the other team or 'wanting it more,'" Houston told the Houston Daily. 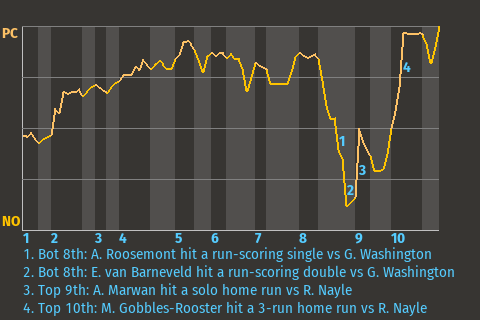 "You win just by scoring more runs."